Home Gay Marriage passes in Maryland House of Delegates! Marriage passes in Maryland House of Delegates! 2/17/12 7:14pm by John Aravosis Comments Off on Marriage passes in Maryland House of Delegates! Kiss me, I’m a homophobe! We got the one vote we needed. Initial reports are that Sam Arora, who ran on a marriage equality platform as a progressive Netroots-friendly candidate, voted against us. More on that below (including his contact info – please visit his Facebook page and Twitter account – again the info is below). The bill had previously passed the state Senate, and no votes are expected to change there, so this is all but assured to go the Democratic governor, who has said he’ll sign it. The religious right has already said they’re going to try to put the issue on the November ballot. UPDATE: It’s confirmed. 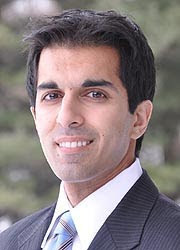 Sam Arora, after reportedly taking calls from the Governor, Bill Clinton and Terry McAuliffe, still voted against us. All this after he run on a platform including marriage equality. Something is up with that guy. As a junior member of a state legislature, it’s just awfully strange that you would flip on an issue like this, right after taking office, with no good explanation why, and then resist appeals from your former employer’s husband (Arora worked for Hillary), who just so happens to be Bill Clinton, and appeals from the current governor, who wants to run for president in 2016. Rather than ingratiate yourself too all of them, as some junior state delegate, you screw them all. Regardless of what Arora is hiding in his political closet, his career in Democratic politics is over. A number of high-level Democratic political operatives in DC are talking this evening about the best way, legally and politically, to move ahead with ending Arora’s career, starting with his next election. We’ve taken down bigger bigots than a Maryland House delegate. If he thinks he’s going to survive in Democratic politics as a known homophobe, and someone who poked his finger in the eyes of Bill Clinton, Terry McAuliffe and Maryland Governor O’Malley… well, good luck with that. Enjoy the next few years in politics, Sam. They’ll be your last in elected office. Here’s the question on marriage where he said he was with us while running for office – again, he changed his mind weeks after being sworn in. Suspicious much?